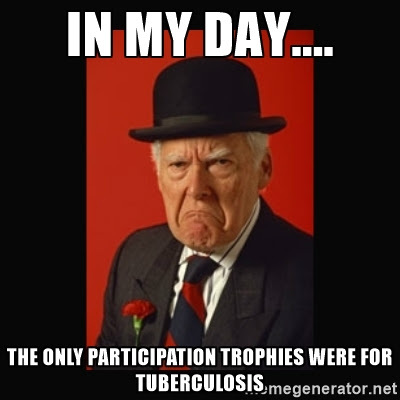 I have heard and seen a growing amount of public hand-wringing over the so-called “participation trophy” generation. Depending on your particular ideological bent, the phenomenon could be responsible for overly-sensitive entitlement liberals or insensitive trust-fund babies that never had to work for anything their entire lives. In either case, the scorned group is portrayed as having been debilitatingly-coddled for so long that they are unable to fathom failure or stomach disappointment. The concept of someone else’s contributions or ideas being valued over their own causes them to demand that the very fabric of society should be altered to conform to their worldview. While there does not appear to be a consensus concerning the time-frame of this unfortunate generation, I suppose this would be the proper juncture to admit that I received several participation trophies as a child. The first was for my T-Ball team when I was 4. It was rather impressive in stature and I displayed it proudly in my room for quite some time. My disillusionment came later when I discovered that both the funding for, and design of, the trophy was the collective responsibility of the team members’ parents. At the age of four, it never occurred to me that our local Recreation and Parks department did not employ an objective oversight committee to distribute them based solely upon merit. My next participation trophy would come in Kindergarten. This one was ostensibly awarded for being “Student of the Month” but I am fairly certain that - despite the statistical implausibility – everyone managed this achievement once. It should also be noted that Kindergarten is much more rigorous now than it was then. Remembering which color-coded table I sat at (the orange one) and managing to avoid peeing on my own shoes practically fast-tracked me to magna cume laude. When my wife starting teaching Kindergarten, it felt like we were a state-standards revision away from book reports on Faust. My final participation trophy was for Fire Prevention Month. You heard me. I got bragware just for NOT starting a fire in the presence of the Fire Marshall and whatever poor intern they forced to wear the Dalmatian costume. That being said, this trophy took its rightful place alongside my T-Ball trophies and student of the month. If my streak continued at this pace, we were going to need a sizable display case before I hit puberty. I suppose one could argue that having parents hand out trophies to their children with blatant disregard for their skill-level or giving awards for being alive and conscious in the same room as a fireman is conditioning them for failure. I believe that the validity of that concern varies greatly with the child’s age. My son is 3 years old and playing rec-league T-Ball where no one keeps score and everyone gets a chance to bat. I argue that it is OK to recognize the sustained effort it takes to work together with one’s peers toward a common goal. It also provides needed encouragement at a very impressionable age. Conversely, I do not believe it is appropriate to hand a fourteen year-old a trophy simply because they did NOT commit arson or to allow high-school students to perpetually retake tests or exams until they reach a desired outcome. There must be a transition period where a child prepares for life by experiencing the tangible (and often cruel) hierarchy of personal achievement. Unlike some of my more athletic peers, I had to come to terms with the fact that trophies awarded for participation were the only ones I was likely to receive. It was not so much an emotionally-devastating moment in time as it was the gradual realization that while I may possess talents and abilities, I would have to make peace with the fact that sometimes our greatest efforts and accomplishments will remain uncelebrated. Sometimes the work is the reward and the right thing to do is the path least likely to garner attention or accolades. If my children manage to embrace that philosophy despite my shortcomings as a parent, I may just have to buy myself a participation trophy.